Until recently I felt similarly about banana in my tea. Obviously not the notion of dipping an actual ripe banana into hot liquid, but the dried banana pieces that sometimes appear in certain flavoured teas. I can’t get my head around it, and figured they were best avoided. Bananas, mushy enough at the best of times, can’t quite be reconciled with the idea of hot liquid in my mind. But here’s a recipe that goes and totally contradicts all of that, because Bluebird’s Banana Bread Chai is actually rather delicious. 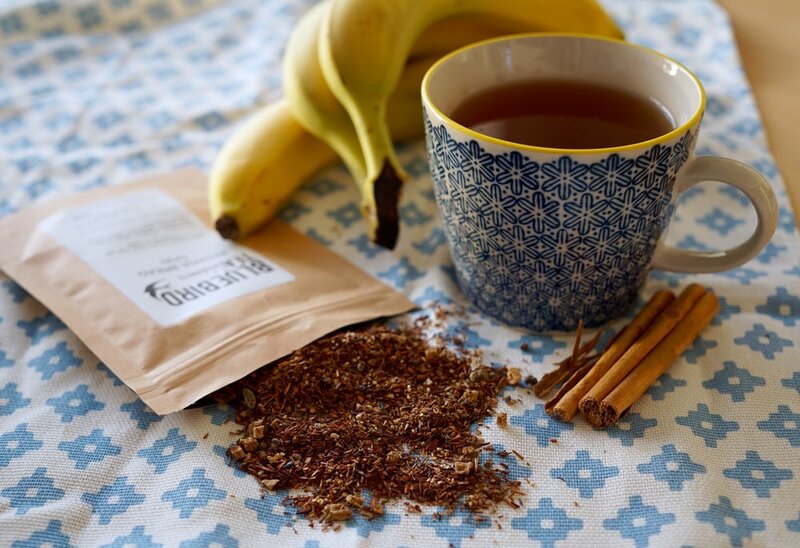 A blend of rooibos, cinnamon, ginger, dried banana, cardamom and vanilla, it has only the merest hint of warm, spiced banana flavour, with a round richness from the rooibos and cinnamon. In fact, it really does taste like banana bread, with none of the bitterness you sometimes get from black chai tea, and without being overpoweringly sweet. I have several ideas for baking with this aromatic creation, but here’s a simple yet unusual and delicious way to spice up your morning porridge with a little banana bread action. I can’t believe I hadn’t thought of this before. Infuse your usual milk with a little tea to add depth and warm spice, then add the oats and fruit as usual – it’s a trick I’ll be trying with other flavours in future. I use banana bread chai tea to give luscious just-baked flavour to the oats, plus sultanas for texture, and a pinch of salt to heighten the flavours. 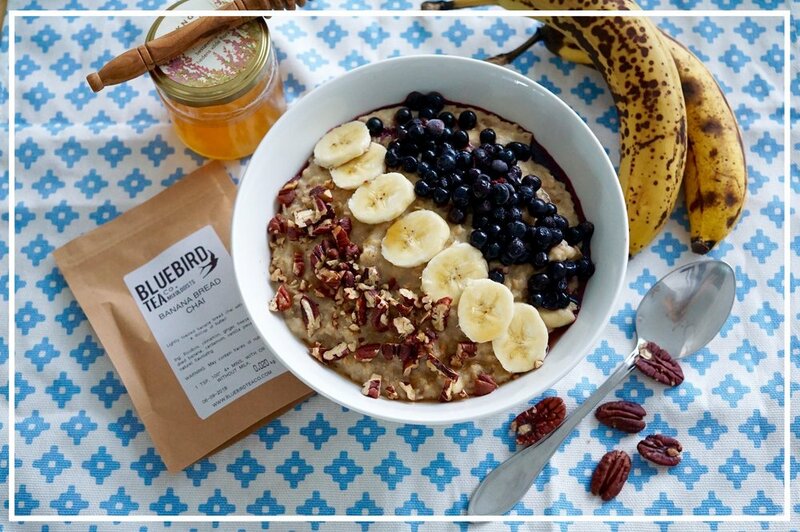 The topping is a beautiful, wholesome mixture of banana, toasted pecans and blueberries – classic banana bread add-ons – plus an obligatory drizzle of maple syrup to bring it all together. You could use honey instead, and feel free to mix up the toppings too - toasted coconut, nut butters, sesame seeds and raspberries would all be fantastic as well. P.S. I eat a lot of porridge. Feel free to halve the quantities if your appetite for oats is not quite as obscene as mine. Put the milk and water into a medium saucepan. Add the tea. Slowly bring to the boil, then turn down the heat and allow to simmer very gently and infuse for 5-10 minutes. Strain the milk through a sieve into a jug to remove the tea, then return it to the pan over a medium heat (discard the tea). Add the porridge oats, sultanas and salt and cook, stirring frequently, until the mixture thickens into your desired consistency. You can add a little more milk or water if you prefer a runnier porridge. Towards the end of cooking, stir in most of the banana, leaving a few slices for decoration. 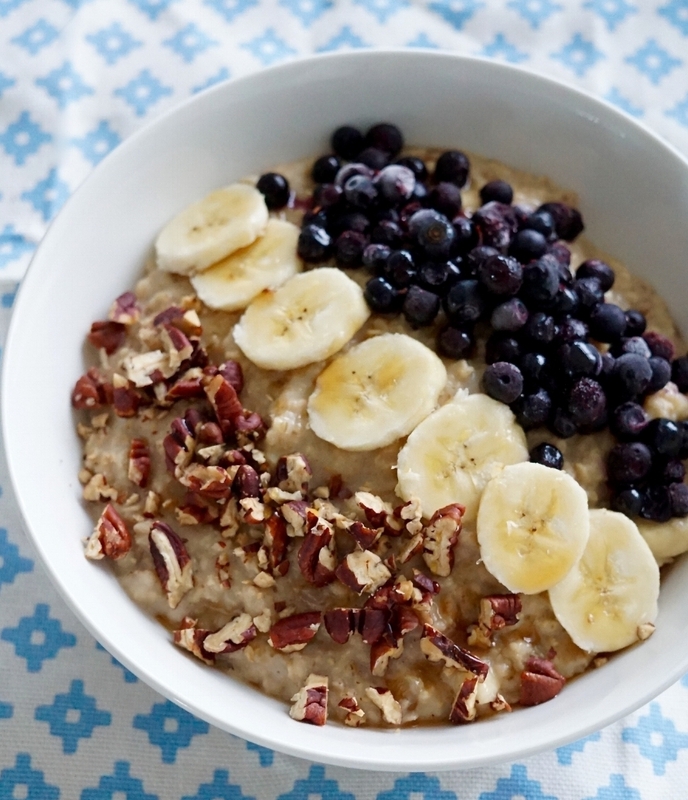 Pour the porridge into a bowl and top with the sliced banana, blueberries and pecan nuts. Drizzle over the maple syrup, to taste, and serve immediately.